It was only back in April when we reported that Facebook has reached 1.44 billion users. It’s fair so stay growth for Facebook is slowing up but the service is still growing. In their latest earning release the Facebook user base has grown by another 50 million monthly active users – now reaching 1.49 billion monthly active users. 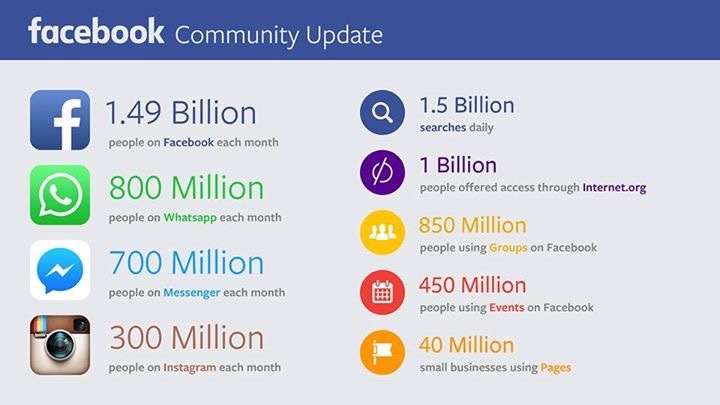 Facebook has gone on to release some other important stats about their services, including WhatsApp, Messenger and Instagram. I expect Facebook will continue to grow their user base as people from developing countries get access to the internet.